RARE, RARE lot available in historic Sunday Villas. Build your own brand new, unique cottage and be a part of one of the coolest communities in Port Aransas! Sunday Villas is on the gulf side of town and close to Anchor drive (walk to the beach) and Sandcastle Drive which is a vehicular beach access road. Easily hop in your golf cart and be at the beach or town within minutes! 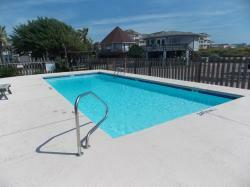 Sunday Villas has a recently renovated community swimming pool area (new photos coming soon). Low HOA dues of $150/month. Short term rentals allowed!